Click Here To Access Articles "Ahead of Print"
Explore all recent issues of the JMIG from your tablet or smartphone. The Journal of Minimally Invasive Gynecology on Your Tablet and Smartphone! 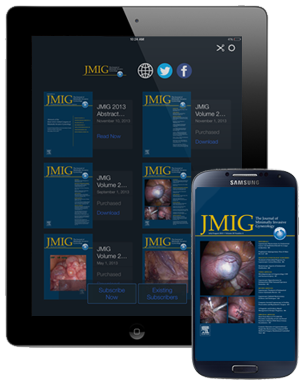 AAGL is pleased to provide the JMIG on Apple, Android, and Amazon tablet and smartphone devices. This benefit of your AAGL membership allows you to receive the Journal on your device on the same day as it goes to print, and also provides you with the ability to review back issues of the JMIG. The app is available to all AAGL members at no additional charge! Click on your App Store icon below to download the app to your device. Once the app is installed, tap on the app icon to start the JMIG app. 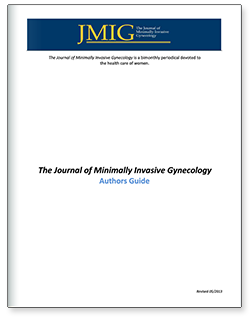 The Journal of Minimally Invasive Gynecology is an international clinical forum for the exchange and dissemination of ideas, findings and techniques relevant to gynecologic endoscopy and other minimally invasive procedures. The Journal, which presents research, clinical opinions and case reports from the brightest minds in gynecologic surgery, is an authoritative source informing practicing physicians of the latest, cutting-edge developments occurring in this important field. Dr. Tommaso Falcone is the Editor-in-Chief of the Journal of Minimally Invasive Gynecology, and is also the Obstetrics and Gynecology Institute Chair at the Cleveland Clinic. He is a graduate of the McGill University Faculty of Medicine in Montreal, and specializes in advanced laparoscopic surgery, infertility, in-vitro fertilization, microsurgery for tubal ligation reversal, surgery for endometriosis, and infertility surgery. Dr. Gary Frishman is a graduate of Columbia University Medical School. He is Professor of Obstetrics and Gynecology at the Warren Alpert Medical School of Brown University where he is Residency Program Director and the Associate Division Director of the Division of Reproductive Medicine. He has served on the Board of AAGL and ASRM and was president of SRS and the Council of Gynecologic Excellence. Dr. Kho is a graduate of Tulane Medical School in New Orleans. She finished her Urogynecology Fellowship training at the Mayo Clinic AZ and is an Associate Professor with the Mayo Graduate School of Medicine. She is the current fellowship director for the minimally invasive fellowship program at the Mayo Clinic in Arizona. Her practice focus is on minimally invasive robotic and vaginal surgery. Dr. Ramirez is a Professor and the Director of Minimally Invasive Surgical Research and Education in the Department of Gynecologic Oncology at MD Anderson Cancer Center. He graduated residency in Obstetrics and Gynecology from Columbia-Presbyterian Medical Center in New York in 1998. His areas of research interest include minimally invasive surgery, fertility preservation in women with gynecologic malignancies, and novel approaches to the surgical staging of patients with gynecologic cancers. Dr. Setubal received his medical degree from the University of Lisbon in 1981, and is currently Director of the Department of Obstetrics and Gynecology, Hospital da Luz – Lisbon. His areas of specialty include endometriosis, fibroids, infertility, and reconstructive pelvic floor surgery. Dr. Setubal is the first person to take on the role of Media Editor for the JMIG, and is responsible for bring new media content, such as video articles, to our readership. Jeffrey Wilson is a Professor of Statistics and Biostatistics and Co-Director of the Biostatistics Core in the NIH Center for Alzheimer at Arizona State University. He is the former Director of the School of Health Management and Policy in the W. P. Carey School of Business. He has served as a co-principal investigator for a number of grants including the Arizona Disease Research Commission and the NIH, and provided research support to many hospitals and health organizations. Mirelle Truong specializes in minimally invasive gynecologic surgeries for advanced stage endometriosis, abnormal uterine bleeding, uterine fibroids, fertility issues, ovarian cysts, pelvic masses, chronic pelvic pain and sexual dysfunction. Truong is fellowship trained in minimally invasive gynecologic surgery, which through the use of newer technology such as robotics allows patients to have a smaller incision, fewer complications, less pain, less blood loss and scarring, and faster recovery time.